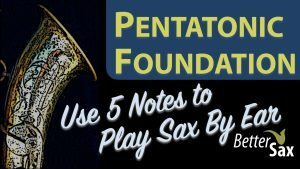 The concept I focus on the most here at BetterSax.com is how to use the pentatonic scale to learn melodies by ear and improvise effective solos. I talk a lot about how to use this scale in my lessons, blog posts, and YouTube videos. I also talk about the importance of transcribing (that is learning melodies by ear). I recommend everyone start out transcribing simple, familiar melodies. In this process you will notice that the pentatonic scale pops up everywhere and you’ll understand why I emphasize it’s importance so much. Lately, I have been transcribing solos by Eric Alexander, one of my favorite saxophone players, and I have come across a particular pentatonic scale lick that he plays from time to time. Since a lot of my lessons are about improvising with the pentatonic scale, I thought I’d share it with everyone. Now this lick is pretty public domain and I wouldn’t attribute it to any single musician. Once you learn to play this lick, you’ll likely end up hearing it all over the place as you listen to improvised solos in all different musical styles. I only mention Eric Alexander here because I heard him play it in a few different solos and it’s a great example of exactly what I’m always harping about. It’s especially important for beginning improvisors to hear and recognize simplicity in the solos they hear by great improvisors. The message here is that things do not always have to be complicated to be hip or groovy or sound good. Often, the simpler lines connect with listeners much more effectively than the crazy complex stuff. Listen to Eric play this exact lick in the video below. There’s a lot going on there in that very long line. First of all, you can hear that he has really developed his ability to put a lot of air through the horn. Just try to play at full volume on tenor for that long on one breath and you’ll see what I mean. The line starts out with another repeated loop like the Easy Lick above. Again, he builds tension through the rhythmic displacement. So this line alternates starting on a down beat and an then an upbeat. At a fast tempo, this is even more effective as you can hear. Instead of using the pentatonic scale this time, the line is chromatic and instead of going up and down, this line only goes up. When he feels it’s time to release the tension this repeated lick has built up, he launches into a long bebop run that covers a lot of ground over the range of the horn. And that is why as improvising musicians, we should be actively searching for music that moves us, and then learn how to duplicate it on our instrument using our ears. When you transcribe, don’t feel like you have to do entire solos or really complex things with lots of notes. Start with little moments that sound great. When you’re starting out, learning to play a line that made you feel great when you heard someone else play it will make you feel even better when you play it yourself. The pentatonic scale is the most useful tool you can use when starting out improvising and learning to play without the burden of sheet music. Please leave your comments below if you have anything you would like to add or ask. Feel free to share this post with others that may be interested. More resources below.. If you want to learn how to use your ear to play things that you hear on recordings, I recommend you take my Pentatonic Foundation Course. You can also sign up for my free PSBE (play sax by ear) Crash Course. 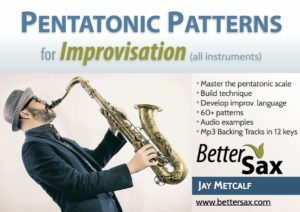 If you are interested in learning how to use the pentatonic scale in improvised solos I invite you to check out my Pentatonic Patterns of Improvisation ebook & backing tracks. If you want to improve your saxophone playing overall. 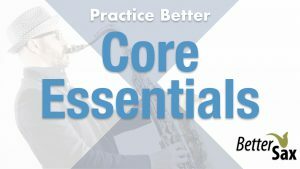 I have a great program called Core Essentials, that shows you exactly what you should be practicing to improve your sound and overall technique on the saxophone. Visit https://bettersax.com/about for links to all my gear. Hi….better sax….I was looking for the…Pentatonic Patterns for Improvisation free download….my email is….susejol@hotmail.com…. Really nice Jay, just came back to this quick lesson and again realize its remarkable versatility and value ! !